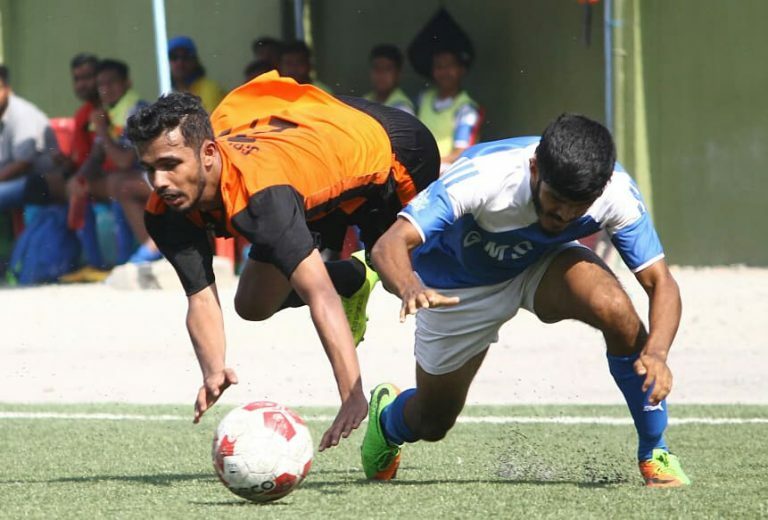 28th March 2019, Mumbai: Over the last two days, four MDFA Elite Division matches were played at the Neville D’Souza Turf in Bandra which saw the likes of Kenkre FC, Union Bank of India (UBI), GM, and Millat FC in action. Kenkre FC, UBI, and GM cruised to victories while Bombay Gymkhana held Millat FC in what was an entertaining game. Here is the summary of the same. Kenkre FC 10-3 Sellebrity: Kenkre FC stole the show after scoring ten past a helpless Sellebrity side in a game which saw a total of 13 goals. Once again, right from the kick-off, it was Augusto D’Silva’s side which went all in to break past Sellebrity’s defense with ease. When the likes of Ashrafali Makandar, Mrunal Tandel, and Jayesh Kadam combines well, there is hardly a chance for the opponents to break their play which has been the case this season. Jayesh Kadam was neat in front of the goal and completed a fine hat-trick with Yash Mhatre and Ashrafali Makandar scoring two goals each. Jay Bhavnani, Lester Fernandes, and Mrunal also got on the scoresheet to move Kenkre’s goal-tally to double figures. Though Celebrity’s attack was still better than their defense, they were only able to net three through Yamik Holkar, Agnelo Picardo, and Ralston Miranda. UBI 3-0 Century Rayon: In the other game, UBI bounced back against Century Rayon after losing their previous game against Dena Bank 1-0. The Bankers has been pretty much inconsistent this season but looked in firm control throughout the game. Paintal Saini got on the scoresheet twice, whereas, star midfielder Valentine Pereira also found the back of the net to give UBI a much-needed win. GM 1-0 Salcette: GMSC doesn’t seem to stop picking up wins as they narrowly defeated Salcette 1-0 in a crucial game. Roysten Castelinho scored the decisive goal in the first-half before GM Goalkeeper Rishabh Shetty saved a brilliant penalty. GM stood firm and strong at the back and snatched all three points in what was a gritty and determined display. Millat FC 1-1 Bombay Gymkhana: Millat FC had hoped to emulate the performance of their previous games but conceded a late goal where they had to settle for a draw. Aniket Shipe opened the scoring in the second half who had scored a hat-trick in Millat FC’s last game. His effort was leveled late in the game when Arthan rescued a point for Gymkhana with a neat finish.